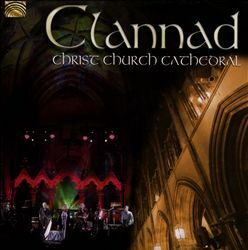 A look at albums we have written about in 2013 – here’s Clannad and their 2013 release ‘Christ Church Cathedral’ taken from Irish Music Magazine. There are not many groups that can boast a forty year longevity in the business yet the picturesque village of Gweedore, nestled in the wilds of the beautiful Donegal, can lay claim to having produced a longstanding and unique sound that has captivated the ears of the listening audience worldwide. Okay, Clannad did take a break for a number of years at the turn of the millennium but if the music is an inherent part of your soul, it can never diminish and they have proved this with the release of a CD and DVD they recorded in the magnificent venue of Christchurch Cathedral in Dublin to celebrate their 40 year anniversary of enchanting music and song. The closeness of the Clannad clan has always been of benefit to the exquisite blend of ethereal voices that have been an iconic part of the Irish tradition with Moya’s distinctive vocal guiding the stirring strings of Crann Úll with an amalgam of symphonic sound creating a full bodied yet gentle ambience in the background. A hypnotic version of Buachaill on Eirne showcases the strength of Moya in a solo capacity and the haunting rendition of the Eleanor Plunkett air confirms that the instrumental expertise plays as much a part in the Clannad sound as the vivid lyricism of the song. The latter half of this special release highlights the chapter of creativity that brought Clannad into the global mainstream of music. With the undoubtedly recognizable Robin of Sherwood and the Theme from Harry’s Game strong contenders for track highlights, it’s the Bono collaboration In a Lifetime that stands out with the striking Brian Kennedy ably replacing the U2 frontman in this captivating version of the song. The DVD incorporates two bonus songs and enhances an already successful recording with the stunning visuals of a truly fantastic setting. Whichever suits, the whole performance is a valid recognition that Clannad richly deserve their elevated place in the Irish tradition.